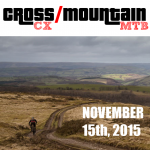 Summary: Back for 2015, the off-road cycling event open to CX and MTB. There are two distance options – a manageable 30-35km or slightly more challenging 50-55km. For 2015 there’s a brand new route, although much of it will be in a similar area to 2014 within the Brecon Beacons. The event includes camping on Saturday night (at extra cost), plenty of free weatherproof hardstanding car parking, showers and toilets, on-site catering, full route marking, well stocked feed stations, bike wash facilities, online results service, first aid support, and event photography to record the day.